On February 16, 2017, the Clean Energy Institute officially opened the Washington Clean Energy Testbeds. Washington State Governor Jay Inslee, cleantech leaders, and clean energy researchers were on hand to celebrate this new facility for accelerating the clean energy innovation cycle. The Clean Energy Institute (CEI) created the Washington Clean Energy Testbeds to increase the rate at which breakthrough science and engineering discoveries turn into market-adopted clean energy technologies. 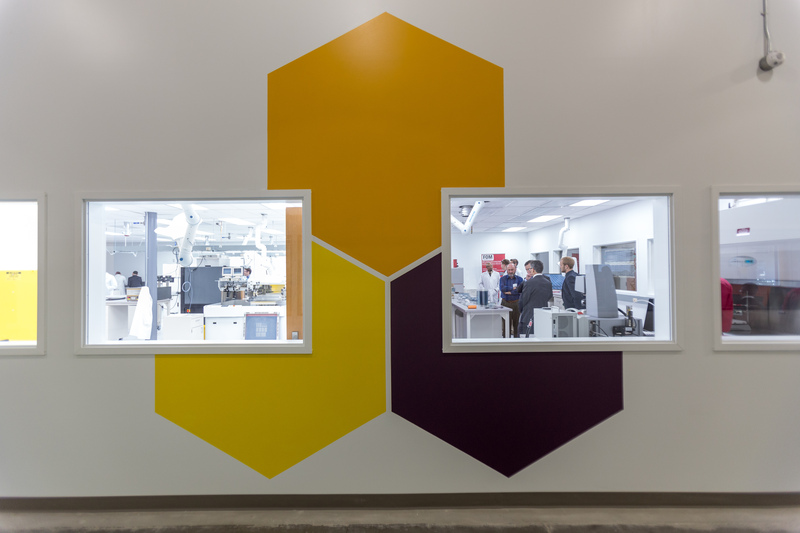 The state-of-the-art user facility has labs for manufacturing prototypes, testing devices, and integrating systems. –Print ultra-low-cost, thin-film solar cells and electronic devices using novel electronic inks. –Fabricate and test new battery systems to dramatically increase performance without compromising safety. –Develop and test energy management software that controls and optimizes how batteries, vehicles, and buildings integrate with a clean energy grid. The Scale-up & Characterization lab at the Testbeds offers a platform for prototyping authentic-scale solar and storage devices as well as testing manufacturing processes. The lab includes a 30-ft-long multistage roll-to-roll printer for solar cells, batteries, sensors, optical films, and thin-film devices and is the only one of its kind in the United States. The Washington Research Foundation (WRF), an organization that provides grants to support research and scholarship in Washington State, funded this sophisticated instrument and helped recruit MacKenzie and staff to Seattle. The “Systems Integration” lab at the Testbeds provides an evaluation platform for testing the performance of energy devices and algorithms when integrated into real and simulated system environments. For example, a real-time digital simulator (RTDS) allows for modeling commercial and grid-scale system performance under normal and extreme conditions. System integration experiments using the RTDS can involve new software algorithms that control or optimize power infrastructure. The lab also includes flexible power hardware and battery storage devices up to 40 kW in scale, allowing authentic testing at the scale of an electric vehicle or commercial building. In addition to lab space, the Testbeds offer users meeting and office space where they can work, collaborate, and further build their cleantech community. An entrepreneur-in-residence, currently John Plaza, holds regular office hours. With more than 20 years of experience in the renewable energy sector, Plaza provides users with insights about the commercialization process, target markets, product development, and fundraising strategies. As part of the Washington Clean Energy Testbeds system, the Research Training Testbed facility provides UW students access to research-quality tools and training in clean energy concepts that cut across academic disciplines. CEI member faculty host laboratory courses in the space, and Testbeds users can access the additional instrumentation when not in use for teaching purposes. The RTT is located in the Nanoengineering and Sciences (NanoES) building at 3946 W Stevens Way NE on the UW campus. Pedro Arduino (CoE), Karl Bohringer (EE), Jim DeYoreo (PNNL/Affiliate UW MSE & UW Chem), Aaron Fever (Energ2), Hanson Fong (MSE), David Ginger (Chem), Chris Heimgartner (SnoPUD), Hugh Hillhouse (ChemE), Paul Hopkins (Chem), Daniel Kirschen (EE), Dawn Lehman (CEI), Steven Leith (Microflow CVO), Jiangyu Li (ME), Christine Luscombe (MSE), Devin MacKenzie (MSE/ME), Arka Majumdar (EE), Steve Majeski (A&S),Daniel Malarkey (1 Energy Systems), Ron Melton (PNNL), Norm Menter (UW Facilities), Miguel Ortega-Vazquez (EE), David Ridley (UniEnergy Technologies), Jerry Seidler (Phys), Daniel Schwartz (ChemE), Eric Stuve (ChemE), Venkat Subramanian (ChemE), Shaun Taylor (CEI), VishViswanthan (PNNL), Dirk Weiss (First Solar), Jan Whittington (Built Environment), Rick Winter (UniEnergy Technologies), Xiaodong Xu (EE), Jihui Yang (MSE), Baosen Zhang (EE), and Jason Zhang (PNNL). For more information on the Washington Clean Energy Testbeds and the planning process, contact managing director Mike Pomfret.